Working in the video game industry, it’s apparent just how much journalism has both been affected by and benefitted from the Internet. While most of the conversation surrounding gaming is still handled by the major outlets – Polygon, IGN, Revision3Games – there are a multitude of outlets that could not have existed without the openness provided by the Internet (VGW included). It is precisely this openness that separates Internet journalism from traditional print media, as it is now possible for anybody to join in on the conversation surrounding their favorite hobby. A great deal of quality work is being produced by people without any direct connection to any kind of “official” outlet, and that’s just fine. Because there are more people writing more passionately about games than in any other time in the history of the medium, the multitude of opinions now available allow anyone with an interest and an Internet connection to find as many different viewpoints on a particular game as they could possibly desire. However, this level of openness does create its own problems. For every quality writer and blogger that exists online, there are hundreds of others who are little more than rage-filled trolls and unswayable fanboys. While this often creates a problem of information overload, it does have certain benefits, primary among them being a more information-literate audience. People are forced to evaluate and recognize credible sources, synthesize information, and form their own opinions and arguments much in the same way that my former First Year Composition students had to with their research assignments. This also applies to other news gathering, as acknowledging bias and the onus of fact checking falls more firmly on the heads of the public. Though this could of course be taken as a detriment to the world of journalism, the fact that readers are now more responsible for recognizing when the information in front of them is either stilted or just plain wrong is building a more intelligent populace, and one that is more capable of making informed decisions. Likewise, Twitter has expanded upon the openness of the Internet, creating a space where not only can users get their news the instant it goes live, but for conversation where anybody can conceivably interact with anyone else. Much like the rest of the Internet, Twitter can often become a space full of clutter; however, as users become more savvy, they have the ability to connect with people in a way that they were previously unable to. Additionally, a spectacular sense of community has been created, as the video games industry is one built on interconnectivity – everyone knows everyone else, and everyone uses Twitter to discuss what they’re playing and what they’re excited about. Much has also been said about the ways in which Twitter also gives voice to previously marginalized people, providing them with a space where they are finally able to be heard. The work that Twitter activists do is astounding, and the fact that something like #NotYourAsianSidekick could trend globally for over twenty-four hours, bringing issues of feminism, race, and intersectionality to a global audience is something that cannot be overlooked (check out creator Suey Park’s awesome blog, Critical Spontaneity). While there are of course numerous issues surrounding both Internet activism and the growing problem of cyberbullying, the benefits of this new level of openness far outweigh any negative consequences. Of course, not everyone has turned towards the Internet for their news and interaction. There are plenty of people who are still firmly invested in their news broadcasts/publications of choice, and that does not appear to be changing any time soon. This even extends to the world of video games, as the magazine Game Informer has more active subscriptions than any other non-AARP print publication. 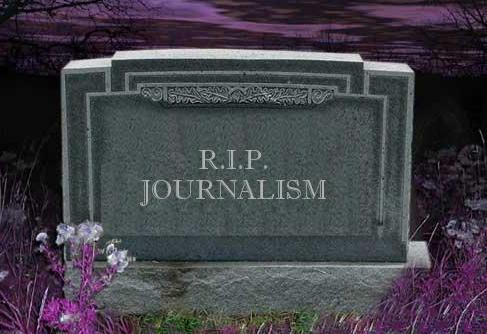 Journalism isn’t dead – it’s just different, and we are all the better for it. Not everything is repurposed content endlessly posted and reposted. APoMo steers us through the background noise and argues that original content is alive and well and in many forms. Keith W. Mathias, Blog at WordPress.com.